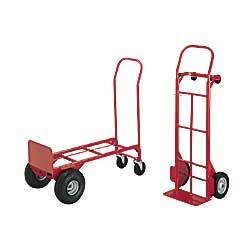 Quickly converts from a two-wheel hand truck to a four-wheel platform truck. Constructed of welded steel with 1" tubing. Available with either semi-pneumatic (SP) or full-pneumatic (FP) wheels. IN STOCK. XP-535 36	 SP	 400	 8"	 300	 14x8"	 8" x 1-3/4"	 46-1/2"	 38x14"	 17" x 46-1/2"
XP-536 42	 SP	 500	 10"	 400	 14x8"	 10" x 2-3/4"	 46-1/2"	 38x14"	 19" x 46-1/2"
XP-537 41	 FP	 600	 10"	 500	 14x8"	 10" x 3-1/2"	 46-1/2"	 38x14"	 22" x 46-1/2"
XP-547 5" polyolefin swivel, fits XP-536 & XP-537.